Solgere is Located just 85Kms from Bangalore city On Bangalore - Mysore Highway(NH-209) and Just 25kms from Kanapauara town In Ramanagara District in Basavanabetta hill range and Cauvery Wildlife Division, Karnataka Forest Department. Soligere is situated in Basavanabetta hill range Cauvery Wildlife Division in Kanakapura taluk Soligere hills has Forest Banglow which is built By Mysore Maharajas in the year 1880. For to take rest Maaharajas Built that banglow.On the Top of Soligere Hills There is No water Facility and Power available. If you wish to stay on the Forest banglow you need To take Permission from Forest department, the banglow is available wih free of Cost. Soligere is about 1125 mts above mean sea level. Standing at such an elevation, you will be able to see an aerial view of many landmarks like the Shimsha and Shivanasamudram hydel projects. Descending from the peak you will reach Soligeri village, and you can also visit the famous Hanumantharaya temple. In Soligere hill you Must Watch Elephants in herds and some unique flora,The beautiful hill range and the river Cauvery flowing through the valleys of these hills. From the Top of Soligere Hills You can see the flow of Kaveri river Up to 8kms. The forest department's Banglow site at Top of Soligere hills is the only availble place to stay. Please fill the contact form to enquire about the availability. From Bangalore trvel 56kms on Bangalore Mysore Highway (NH-209) you reach Kanakapura Town and at 70kms You reach Sathanur village on NH-209 from sathanur travel abou 5 kms you Reach honaganahalli village on highway in Honaganahalli take left form Highway then at 8kms You reach Soligere Village and travel about 5 kms from village at last you reach Soligeri hill. 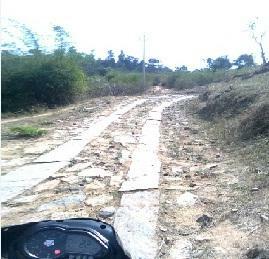 But the roads are very Bad from honaganahalli to Soligere hills.